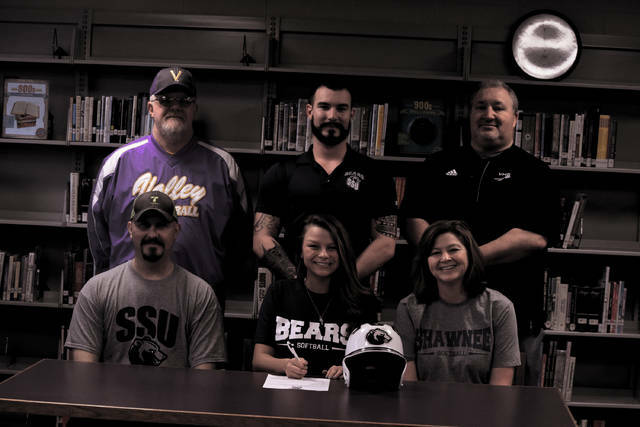 Valley senior softball standout Marissa Markins, an All-SOC and All-District talent with an excellent glove at first base, signed to play for the Shawnee State University softball program on Friday evening. Markins, who also played volleyball for the Lady Indians, adds a strong bat to the Bears’ lineup. In anything that one does in life, it’s always important to be passionate and energetic. And over the course of her four-year experience at Valley High School, Marissa Markins certainly qualifies in that category. The two-sport standout, who has obtained All-SOC and All-District honors in softball during each of the past two seasons, used her clever fielding abilities and her top-notch batting to obtain an opportunity to play for the Shawnee State University softball program on Friday evening in a signing ceremony that was held inside the VHS halls in Lucasville. For Markins, the opportunity to play for an emerging softball program at Shawnee State — which improved dramatically from an 11-35 campaign in 2016 to a 24-24 mark in Steve Whittaker’s second season with the program in 2017 — is a great honor that the rising senior plans to take full advantage of. However, Valley head coach Monte Spriggs and Shawnee State University assistant coach Daulton Kenyon know that the opportunity is a well-deserved one considering the amount of work that Markins has put in as a player inside the program. Over the course of her high school career, Markins has developed from a promising role piece with potential into arguably the Lady Indians’ most complete hitter and fielder. A first baseman who has made outstanding stretches at the position with her stride, Markins has obtained All-SOC and All-District honors as a sophomore and as a junior due to these traits. The senior also obtained All-SOC honors to end her volleyball career earlier in the fall. However, those accomplishments, Markins says, are all in part to the people that have surrounded her over the years. Ultimately, however, it’s been up to Markins to make the necessary improvements in her game — and make no mistake about it, the work that the senior has put in hasn’t gone unnoticed, especially considering that Spriggs called her “the ideal first basemen” at the signing. Markins’ passion for the game — and her school — however, sets her apart as much as anything else. At Shawnee State, Markins will not only join a program that made a 13-win improvement from 2016 to 2017 — including a jump from a 4-20 Mid-South Conference mark in 2016 to a 12-12 showing in 2017 — but one that looks like it isn’t settling for just .500 ball. Whittaker and his coaching staff have already added Louisiana State University transfer Michal Cunningham — an All-State standout at Wheelersburg — into the fold, which already includes former Valley standout and Bowling Green transfer Kayla Koch. Koch hit .336 last season for the Bears and emerged as a serious power threat for Shawnee State in collecting seven home runs and 12 doubles on the year. With Koch back on the roster to lead the unit as a senior, and Whittaker — who made the transition to collegiate athletics after overseeing a wildly successful Buckeye Elite program that won 350 games to just 85 losses, which was an average of 35 wins to eight losses a season, over his tenure in coaching the Buckeye Elite ‘97 and Buckeye Elite ‘03 programs — proving himself as a clear developer of talent, it’s clear that the SSU softball program is on the rise. With her college decision out of the way, Markins, however, wants to focus on one thing — delivering success for her fellow teammates and the coaching staff at Valley. But regardless of what happens in 2018, Spriggs says that the sky is clearly the limit for Markins if she continues to work like she has.